Last chance to see Fangs, Fur & Feathers: The Art of Animals at the MAC! 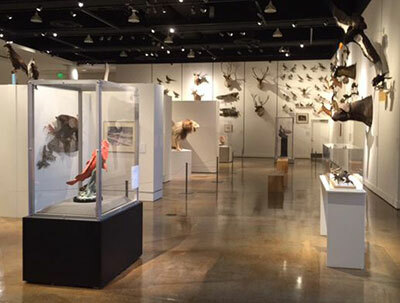 Don't miss your chance to see more than 300 specimens of animals, from leeches to terrestrial giants, at the Northwest Museum of Arts & Culture in Browne's Addition. This nationally touring show's last day is Labor Day, Monday, September 5, from 10am to 5pm. A large variety of historically important taxidermied animals are on display, including many from the museum's natural history collection from the old Campbell House Museum days. This fantastic display of species will delight both young and old visitors. Fangs, Fur & Feathers includes many works of art depicting animals from the 13th century through the late 20th centering, featuring tigers, birds, horses, sheep, monkeys, bears and more. Many famous artists are represented, including John James Audubon, Francisco Jose de Goya, Titian Ramsay Peale, Peter Moran, and Antoine Louis Barye. For more information, visit www.northwestmuseum.org. 85 free concerts on three stages are coming your way this week starting today, August 31 through Labor Day, September 5 at Pig Out in the Park. Celebrate with Rare Earth's Peter Rivera Friday night at 8:45 on the Clocktower Stage. Sir Mix a Lot is coming to the Lilac Stage Friday at 9. And Mark Farner formerly with Grand Funk is on Saturday at 9. I will be the emcee at the Clocktower Stage introducing 30 bands, so come down and say hello! 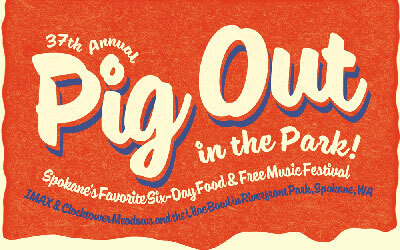 Get the complete entertainment schedule at spokanepigout.com. 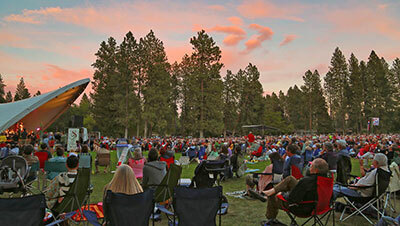 Say farewell to summer in spectacular fashion at Spokane Symphony's free Labor Day Weekend parks concerts. The Spokane Symphony, conducted by Resident Conductor Morihiko Nakahara and Assistant Conductor Jorge Luis Uzcategui, will treat guests to a night of wonderful music with their lineup of light classics, patriotic tunes and favorites from the world of pop, Hollywood and Broadway. Labor Day Weekend at Pavillion Park, Saturday, September 3 at 6pm. This year marks the 15th Annual Ludlow Kramer Memorial Concert at Pavillion Park in Liberty Lake, where the Symphony performs a family friendly concert that is the finale of The Friends of Pavillion Park's Summer Festival. Labor Day at Comstock Park, Monday, September 5 at 6pm. The Spokane Symphony is celebrating its 30th year of offering its annual Labor Day Concert in Spokane's Comstock Park. So bring your blankets, chairs and picnics for two great Labor Day weekend concerts! You have until Saturday, September 3 to see the Michael Lee and Carla O'Connor exhibit at the Art Spirit Gallery at 415 Sherman in downtown Coeur d'Alene. Go to theartspiritgallery.com to see the show online. Mark your calendars for a weekend full of entertainment at Valleyfest, Saturday & Sunday, September 24 and 25 at Mirabeau Point Park and CenterPlace Regional Event Center. There will be lots of great music, food, family activities, a comedy competition, car show, and much more. For more information, visit Valleyfest.org. Thursday's 'Patio Performers' concert series continues at Arbor Crest and this Thursday, September 1, Ryan Larsen Duo performs pure Country. Music runs from 4:30-6:30, no cover. On Sunday, September 4, Arbor Crest's Concerts on the Cliff features Atomic Jive, an 8-piece R&B Swing band. Music starts at 4:30 and runs to sunset, there is an $8 cover. Arbor Crest wines, beer and food available for purchase. Duran Duran takes the stage this Friday night, September 2 at 7:30 at Northern Quest in their outdoor concert venue. Go to northernquest.com for your seats. The Spokane Art School Gallery at 811 West Garland presents 'It all Started with a Box of Crayons' by Joseph Tomlinson starting with a reception Friday, September 2 at 5pm. Go to spokaneartshcool.net for details. Schauer With Friends Jazz Quartet will be performing at the Patit Creek Tasting Room for First Friday, September 2. Music runs from 7-9. Spokane's historic Steam Plant's north lot is host to the Blues & Brews Festival on Saturday, September 10, from noon-5pm. The event includes live music, microbreweries, and food trucks. One ticket provides two samples of beer (over 21). Music runs all day and features local bands Charlie Butts and the Filter Tips, The Bobby Patterson Band and Lucky Stryke who will perform high-energy R&B sounds. A portion of the proceeds benefit Big Brothers Big Sisters of the Inland Northwest. Ages 21 and older: $10; under 21: $5; family of 4: $20. The Steam Plant smokestacks will be lit in color that night in honor of Big Brothers and Big Sisters of the Inland Northwest. For information, list of participating vendors, and tickets, visit www.steamplantspokane.com/events.